During excavation for the MIT.nano building, the Department of Facilities unearthed the capsule, whose creators said it could last as many as 3,000 years. 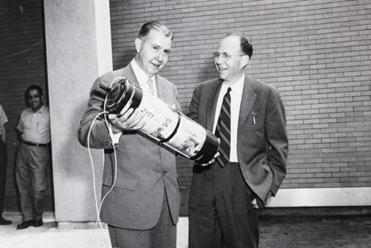 A 1957 photograph shows president James R. Killian Jr. and electrical engineering professor Harold “Doc” Edgerton with the capsule. When constructing a time capsule in 1957, scientists and researchers at the Massachusetts Institute of Technology didn’t rely on a wood or copper box. Instead, they built a cylindrical time capsule made of glass, sturdy enough to withstand the elements for at least 1,000 years. In January, during the early construction phase of the MIT.nano building, crews from the school’s Department of Facilities stumbled upon the glass canister wedged into a pipe in the ground. After consulting with Deborah Douglas, MIT’s curator of collections, the school determined that the capsule was placed at the site 58 years ago, just days before a dedication ceremony for the Compton Laboratories — or Building 26 — which had opened that year. The glass object was handblown by the school’s RLE Glass Blowing Lab, according to school officials, and planted by then-President James R. Killian Jr. and world-renowned professor of electrical engineering Harold “Doc” Edgerton. A mini-documentary about the capsule’s discovery was shared on the Web by the school this week. There was a delay in announcing the rare find because that capsule had to be decontaminated, and Douglas and the school had to digitize photos and video footage from 1957 showing the capsule being constructed and later buried. Douglas said the most interesting bit of history about the container isn’t necessarily the items that are tucked neatly inside — it’s how the time capsule itself was created, and how long it was meant to remain underground. In the video about the container’s origins, Peter Houk, a technical instructor at MIT’s Glass Lab, which continues to operate today, explains that glass is the perfect material to use for a time capsule because it’s inert. According to a note visible inside, the time capsule should stay sealed until 2957, which Douglas called both unusual and ambitous. But Houk said its design could surpass that, if it needed to. “This could last at least 1,000 years. Maybe 2,000 or 3,000 years,” he said in the video. The cylinder was filled with argon gas before it was sealed airtight by glassblowers with torches. According to the MIT News Service, carbon-14 was added to the container so future scientists could accurately pinpoint the date when it was buried. 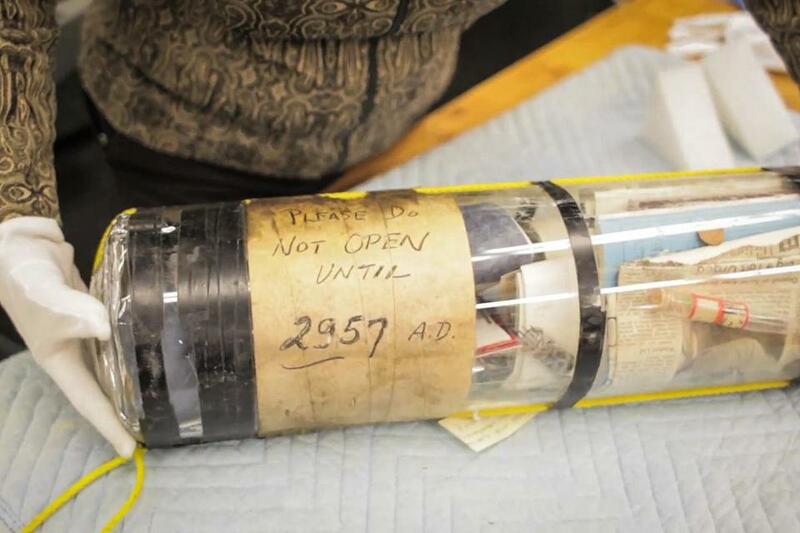 Eight time capsules are believed to be buried around MIT’s campus, but this is likely the only one of its kind. MIT hasn’t opened it, and there are tentative plans to bury it again, alongside a new capsule, when the MIT.nano building is complete. For now, it remains behind the scenes at the MIT Museum.